Factor associated with neutral sphingomyelinase activation (FAN) represents a p55 TNFR (TNF-R55)-associated protein essential for the activation of neutral sphingomyelinase. By means of the yeast interaction trap system, we have identified the scaffolding protein receptor for activated C-kinase (RACK)1 as an interaction partner of FAN. 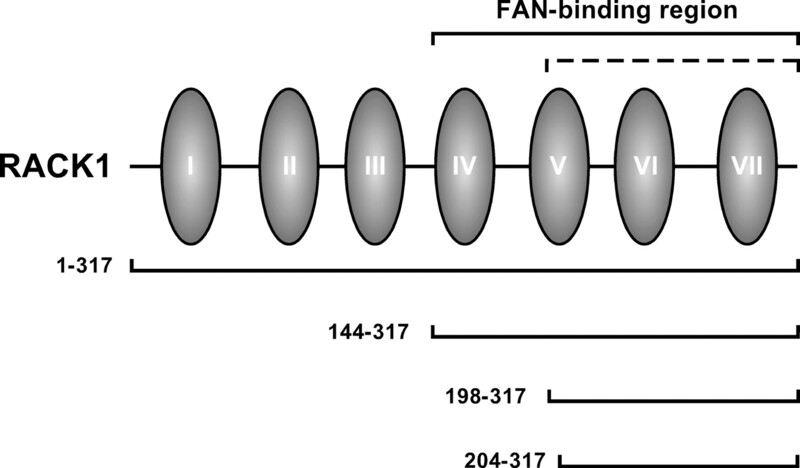 Mapping studies in yeast revealed that RACK1 is recruited to the C-terminal WD-repeat region of FAN and binds to FAN through a domain located within WD repeats V to VII of RACK1. Our data indicate that binding of both proteins is not mediated by linear motifs but requires folding into a secondary structure, such as the multibladed propeller characteristic of WD-repeat proteins. The interaction of FAN and RACK1 was verified in vitro by glutathione S-transferase-based coprecipitation assays as well as in eukaryotic cells by coimmunoprecipitation experiments. Colocalization studies in transfected cells suggest that TNF-R55 forms a complex with FAN and that this complex recruits RACK1 to the plasma membrane. Furthermore, activation of N-SMase by TNF was strongly enhanced when RACK1, FAN, and a noncytotoxic TNF-R55 mutant were expressed concurrently, suggesting RACK1 as a modulator of N-SMase activation. Together, these findings implicate RACK1 as a novel component of the signaling pathways of TNF-R55. The cytokine TNF mediates pleiotropic inflammatory and immunoregulatory responses, as well as cytotoxicity, anti-viral activity, and stimulation of cell growth (1). Induction of these responses by TNF is mediated by binding to two distinct cell surface receptors of 55 kDa (TNF-R55) and 75 kDa (TNF-R75) apparent molecular mass. Major advances in understanding how signals are transduced by TNF-R55 have been achieved by the identification of distinct cytoplasmic domains of the receptor. The C-terminal death domain of TNF-R55, which spans ∼80 amino acids, is responsible for the initiation of programmed cell death and activation of NF-κB, stress-activated protein kinases, and p38 mitogen-activated protein kinase (2, 3). In contrast to the extensively studied death domain, signaling mediated by other cytoplasmic domains of TNF-R55 is less well defined. In previous studies, we have identified a small region at the very N terminus of the death domain, designated the neutral sphingomyelinase (N-SMase)4 activating domain (NSD) (4), that is responsible for the TNF-induced activation of N-SMase. We have demonstrated that the adapter protein factor associated with N-SMase activation (FAN) is required for the stimulation of N-SMase. FAN represents a member of the WD40 (or WD-repeat) family of proteins that includes mainly regulatory proteins. The WD-repeat motif consists of a conserved core of 23–41 amino acids, usually bounded by Gly-His (GH) and Trp-Asp (WD), and is implicated in mediating protein-protein interactions (5). Accordingly, we have provided evidence that the C-terminal WD repeats of FAN interact with the NSD of human TNF-R55 and that this interaction is required for N-SMase activation (6). 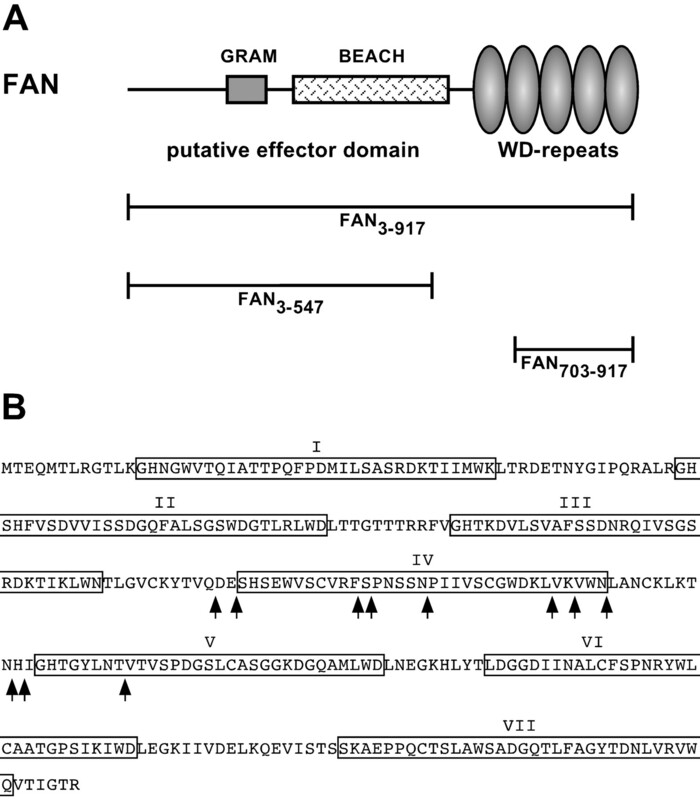 N-terminally truncated FAN, containing only the WD repeats, inhibits N-SMase activation in a dominant negative manner (6), suggesting that it lacks a putative effector domain in the N terminus. Notably, the putative effector domain of FAN contains a region of significant homology to the BEACH (Beige and CHS) domain present in the mouse WD-repeat protein Beige and its human homolog, the CHS protein (7). The BEACH domain has also been found in several other WD-repeat proteins—Vps15, LvsA, LvsB, neurobeachin, and LBA (8, 9, 10, 11, 12)—all of which have been implicated in the regulation of vesicular trafficking. A second region of homology within the N terminus of FAN shows similarity to the GRAM domain, a motif found in glucosyltransferases, myotubularins, and other putative membrane-associated proteins (13). Recently, a WD-repeat-like domain has been defined for the LBA protein that is also found in the putative effector domain of FAN (12). However, so far, the significance of neither homology region for the function of FAN has been examined. Aside from its role in TNF-induced activation of N-SMase, and aside from a putative involvement of FAN in apoptosis (14, 15), actin reorganization in macrophages (16), as well as cutaneous barrier repair (17), possible further signaling functions of FAN have largely remained elusive. Receptors for activated C-kinase (RACKs) comprise a group of cytosolic proteins that can bind to activated isoforms of protein kinase C (PKC). It has been suggested that RACKs facilitate the translocation of PKC isoforms to cellular membranes and simultaneously stabilize PKC from premature degradation (18). RACK1 is a 36-kDa protein with homology to the β subunit of heterotrimeric G proteins, that, like FAN, is characterized by the presence of (seven) WD repeats (19), structures which have the potential to fold into multibladed-propeller-like structures (5). The WD repeats in RACK1 are conserved from Chlamydomonas to human (20), indicating that the function of RACK1 was presumably established before the evolutionary divergence of plants and animals. Recent results indicate that RACK1 is a scaffolding protein that is involved in the recruitment, assembly, and regulation of a number of different signaling molecules into membrane-associated complexes. Proteins recruited by RACK1 comprise PKCβII, PKCε, the cytoplasmic tyrosine kinase c-src, the β subunit of integrins, (18, 21, 22, 23), as well as a number of other cytoplasmic and viral proteins (24, 25, 26, 27, 28, 29, 30, 31, 32, 33, 34, 35, 36, 37). Functionally, RACK1 has been implicated in the development of cardiac hypertrophy and failure, the regulation of cell adhesion, protection of tumor cells from E1A-induced apoptosis, age-associated decline in alveolar macrophage functions, assembly of signaling complexes at the platelet-derived growth factor receptor, integrin-dependent cell migration, negative signaling for superoxide anion generation, and the recruitment of STAT1 to the human type I IFNR (21, 27, 30, 38, 39, 40, 41, 42). Moreover, RACK1 interacts with the pleckstrin homology (PH) domains of several proteins in vitro, indicating that it may aid in colocalizing PKC with its PH domain-containing substrates (43). However, only a subset of these interactions depends upon PKC stimulation (23). In addition, some of the interactions between the proteins listed above and RACK1 appear to be mutually exclusive (22, 27), suggesting that RACK1 forms distinct cellular signaling complexes in response to unique cellular stimuli. We have identified RACK1 as an interaction partner of FAN by means of the yeast interaction trap system. RACK1 specifically binds to FAN, as demonstrated by coimmunoprecipitation and GST coprecipitation experiments. Deletion studies in yeast map the interaction domains of both proteins to WD repeats IV to VII of RACK1 (minimally encompassing parts of WD repeat V to WD repeat VII), and to the C-terminal WD-repeat region of FAN. The interaction of FAN and RACK1 appears to be dependent on the folding of the WD repeats into a secondary structure–conceivably the proposed multibladed propeller—because no prominent linear binding motifs were identified in the WD-repeat region of FAN. Confocal laser-scanning microscopy studies suggest that overexpressed FAN and RACK colocalize at the plasma membrane together with TNF-R55. At the functional level, concurrent overexpression of FAN, RACK1, and a noncytotoxic deletion mutant of TNF-R55 strongly enhanced TNF-induced stimulation of N-SMase. Our findings suggest a novel linkage between TNF-R55 and RACK1/PKC-mediated signaling pathways. The plex.FAN constructs were generated by cloning restriction fragments of FAN containing amino acids 3–917 (FAN3–917) and 3–547 (FAN3–547) into plex202. Sequencing verified that the inserts were in the correct reading frame. The generation of the Jurkat cDNA library fused to a synthetic activation domain has been described elsewhere (44). The HeLa cDNA expression library was purchased from Clontech Laboratories (Palo Alto, CA). Transformation of the yeast strain EG48/JK103 (45) with bait constructs and, subsequently, with the library DNA or selected activation domain fusion constructs was performed as described (44). Transformants were grown on Ura−His−Trp− glucose plates, before selection for leucine prototrophy on Ura−His−Trp−Leu− galactose plates was used to test for positive interaction. Expression of the bait constructs was verified by immunoblots using a monoclonal anti-lex Ab (BD Biosciences, Heidelberg, Germany). Testing for β-galactosidase expression was performed on either Ura−His−Trp− galactose X-Gal plates or, for quantification, in a liquid assay. Yeast cells were grown overnight at 30°C in Ura−His−Trp− galactose medium to an OD600 of ∼1.8, diluted 1/5 in the same medium and grown at 30°C to an OD600 of 0.5–0.8. Cells were washed, resuspended in Z-buffer (60 mM Na2HPO4, 40 mM NaH2PO4, 10 mM KCl, 1 mM MgSO4, pH 7.0), and lysed by freezing/thawing. The cells were diluted 1/8 in Z buffer containing 0.27% (v/v) 2-ME. The reaction was started by adding 160 μl Z buffer containing 4 mg/ml o-nitrophenyl-β-d-galactoside, incubated at 37°C, and stopped with 0.4 ml of 1 M Na2CO3. After precipitating the cells, the OD420 of the supernatants was determined. β-Galactosidase units were calculated by the following equation: units = 1000 × OD420/(elapsed time of incubation (min) × volume of cells (ml) × OD600). The insert of pJG.RACK144–317 coding for amino acids 144 to 317 was expressed as a GST fusion protein using the bacterial expression vector pGEX4T1 (Amersham Biosciences, Freiburg, Germany). Cultures of Escherichia coli XL1-Blue containing pGEX-RACK1144–317 were induced with 2 mM isopropyl-β-d-thiogalactoside for 6 h at 37°C. Bacteria were harvested, resuspended in PBS containing 1% (v/v) Triton X-100, and lysed by three freeze/thaw cycles. After centrifugation at 12,000 × g for 10 min to remove debris, the supernatant was passed through a glutathione Sepharose 4B column (Amersham Biosciences). The column was washed three times with PBS, and GST fusion protein was eluted by the addition of 50 mM Tris (pH 8.0)-10 mM glutathione according to the manufacturer’s instructions. GST-RACK1144–317 fusion protein (15 μg) or GST alone were preincubated with glutathione Sepharose 4B beads for 1 h at 4°C in PBS containing 1% (v/v) Triton X-100 and collected by centrifugation. The precipitates were resuspended in binding buffer (50 mM Tris-HCl, pH 7.5, 100 mM NaCl, 0.1% (v/v) Nonidet P-40 (NP40), 1 mM EDTA, and 5% (v/v) glycerol) and the entire coding regions of FAN or cytosolic phospholipase A2 (cPLA2) that had been synthesized in vitro using the SP6-coupled TNT Reticulocyte Lysate System (Promega, Madison, WI) and [35S]methionine (Amersham Biosciences) were added. After incubation for 2 h at 4°C, the beads were washed three times in binding buffer containing 500 mM NaCl. Subsequently, the bound proteins were eluted by boiling in SDS sample buffer, resolved by 8% (w/v) SDS-PAGE, and analyzed after autoradiography on a phosphoimager. For the isolation of a full-length cDNA for RACK1, the insert of pJG.RACK144–317, representing the largest of all clones isolated in the yeast interaction trap system, served as a probe to screen a human skeletal muscle cDNA library (lambda ZAP Express; Stratagene, Amsterdam, The Netherlands) by standard methods (46). The cDNA inserts of the isolated phage plaques were excised in vivo, following the instructions of the manufacturer, and sequenced. All clones isolated proved identical, containing the entire coding region of RACK1. Subsequently, the entire coding region of RACK1 (amino acids 1–317) as well as C-terminal fragments coding for amino acids 198–317 and 204–317 were amplified by PCR adding restrictions sites for EcoRI/SalI (RACK1–317) or EcoRI/XhoI (RACK1198–317 and RACK1204–317). The above fragments were then subcloned into both bait (plex202, EcoRI/SalI) and prey vector (pJG4–5, EcoRI/XhoI; Ref. 45) of the yeast interaction trap system. The insert of pJG.RACK144–317 was isolated as an EcoRI/XhoI fragment and subcloned into the EcoRI/SalI sites of plex202. As far as not yet available from the initial yeast interaction trap screens, bait and prey constructs of FAN3–917, FAN3–547, FAN703–917, as well as Apaf-1577–1182 (original construct kindly provided by Dr. X. Wang, Howard Hughes Medical Institute and Department of Biochemistry, University of Texas Southwestern Medical Center, Dallas, TX), were generated by the same procedure as above. All constructs were verified by sequencing. Cellulose filters containing FAN-derived peptide scanning libraries were purchased from Jerini Bio Tools (Berlin, Germany). Radiolabeled whole cell extracts from Jurkat cells were prepared by incubation of 3 × 107 cells with 2.5 mCi in vitro cell-labeling mix (>1000 Ci/mmol of l-[35S]methionine and l-[35S]cysteine; Amersham Biosciences) in methionine/cysteine-free medium for 4 h, followed by two washes in PBS and lysis in HDP (30 mM HEPES pH 7.9, 10% (v/v) glycerol, 7 mM MgCl2, 10 mM KCl, 1 mM DTT, 0.1% (v/v) NP40, 10 μg/ml aprotinin and leupeptin) by freezing/thawing. The cell lysate was incubated on peptide filters that had been prewashed twice in methanol and twice in PBS, in 1× SuperBlock blocking buffer (Pierce, Rockford, IL) in HDP overnight at 4°C with continuous shaking. After five washes at room temperature in NET (150 mM NaCl, 50 mM Tris pH 7.5, 5 mM EDTA, 0.05% (v/v) NP40), filters were air-dried and autoradiographed. Binding of the cell lysates to individual peptides was quantified using a phosphoimager. 293 (human embryonic kidney) and COS-1 cells were originally obtained from the American Type Culture Collection (Manassas, VA). Cells were grown in high glucose DMEM supplemented with 10% (v/v) fetal calf serum, 10 mM glutamine, 50 μg/ml penicillin, and 50 μg/ml streptomycin (Invitrogen, Groningen, The Netherlands) in a humidified incubator at 5% (w/v) CO2. The coding region of RACK1 was amplified by PCR and ligated into pcDNA3.1−/Myc-His A (Invitrogen) as an N-terminal fusion to the myc tag of the vector, yielding plasmid pMYC.RACK1–317. For coimmunoprecipitation experiments, 1.8 × 106 293 cells were transiently transfected with 5 μg of pMYC.RACK1–317 or pcDNA3.1−/Myc-His A in combination with 5 μg of pFLAG.FAN3–917 or pFLAG.CMV2 (6) by the calcium phosphate precipitation method. After 48 h, cells were detached using 2 mM EDTA, lysed in TNE buffer (50 mM Tris, pH 8.0, 150 mM NaCl, 1% (v/v) NP40, and 2 mM EDTA) containing 10 μg/ml aprotinin/leupeptin, and 3 mg of cellular lysates were precleared with γ-bind-Sepharose (Amersham Biosciences). Immunoprecipitation was performed overnight on ice using 3 μg of anti-FLAG M2 IgG1 mAb (Sigma-Aldrich, Taufkirchen, Germany) or 1.4 μg of anti-myc IgG1 mAb (Invitrogen) followed by collection of the immunocomplexes by a 1-h incubation with γ-bind-Sepharose and subsequent washing of the immunocomplexes for three times in TNE, once in TNE containing 1 M NaCl, and once more in TNE. The immunoprecipitated proteins were separated on 4–20% (w/v) gradient gels by SDS-PAGE. For detection of expressed tagged RACK1 and FAN protein in total cell lysates, 20 μg of cell protein per lane were resolved by SDS-PAGE. After electrophoretic transfer to nitrocellulose (Whatman-Biometra, Göttingen, Germany), reactive proteins were detected using anti-myc and/or anti-FLAG Ab M2 by the ECL detection kit (Amersham Biosciences). Coimmunoprecipitations of endogenous RACK1 and FAN with TNF-R55 were performed essentially as above with the following modifications: untransfected 293 cells were lysed in TNB (20 mM Tris pH 8.0, 140 mM NaCl, and 0.5% (v/v) Brij58) supplemented with the Protease Inhibitor Mix Complete (Roche Diagnostics, Mannheim, Germany), 2.7 mg of cellular lysate were immunoprecipitated without preclearing using 3 μg of anti-TNF-R55 htr-9 IgG1 mAb (Bachem, Heidelberg, Germany) or 1 μg of anti-FAN N-19 goat polyclonal Ab (Santa Cruz Biotechnology, Heidelberg, Germany) followed by SDS-PAGE, and endogenous RACK1 and FAN proteins present in the immunoprecipitates were detected using either anti-FAN Ab N19 or anti-RACK1 IgM mAb (BD Biosciences). A SalI-EcoRI fragment from the human TNF-R55 encoding amino acids 1–345 was isolated from pADB-TR55 (47) and cloned into the expression vector pEF-BOS (48) yielding pEF.TNF-R55Δ345. COS-1 cells were transiently transfected by electroporation at 280 V/960 μF using 5 μg of pMYC.RACK1–317, pFLAG.FAN3–917, and/or pEF.TNF-R55Δ345, and grown to subconfluency on coverslips for 24–48 h before fixation in 2.5% (w/v) paraformaldehyde in PBS for 30 min at room temperature. The coverslips were washed two times in PBS and once for 10 min in TBS to remove the fixative followed by permeabilization and blocking of nonspecific sites with 0.05% (w/v) Saponin and 0.1% (w/v) BSA in TBS containing 0.1% (w/v) glycine for 1 h at room temperature and three washes in TBS for 5 min each. Cells were incubated with primary Abs (anti-myc mouse monoclonal IgG1 (1:100), anti-FLAG mouse monoclonal IgG1 (1:200), affinity-purified anti-FLAG rabbit polyclonal antiserum (1:50; Zymed Laboratories, San Francisco, CA), anti-TNF-R55 goat polyclonal affinity-purified IgG (1:50; R&D Systems, Minneapolis, MN) in TBS for 1 h at 37°C. After washing three times in PBS (5, 10, and 15 min), cells were incubated with secondary Abs (FITC-conjugated donkey anti-rabbit or anti-goat IgG (1:100), rhodamine-conjugated donkey anti-mouse IgG (1:100), CY5-conjugated donkey anti-rabbit IgG (1:350); Dianova, Hamburg, Germany) for 1 h in TBS at 37°C. Cells were again washed three times in PBS (5, 10, and 15 min) before stained proteins were visualized using a Zeiss LSM 510 confocal laser-scanning microscope (Zeiss, Jena, Germany). Final digital images were processed by increasing contrast of all images by 50% using Adobe Photoshop 4.0 (Adobe Systems, Mountainview, CA). 293 cells (1.5 × 106) were transiently transfected with 5 μg of pcDNA3.1−/Myc-His A or with 5 μg of pFLAG.FAN3–917, pMYC.RACK1–317, or pEF.TNF-R55Δ345, either individually or as a combination of all three constructs, by the calcium phosphate precipitation method. After 48 h, cells were treated in triplicate in 0.5 ml medium with 100 ng/ml human recombinant TNF (a gift from Dr. G. Adolf, Bender Research Institute, Vienna, Austria) for 0–5 min. Cells were homogenized as described (49), except that 0.5% (w/v) 3-[(3-cholamidopropyl)dimethylammonio]-1-propanesulfonate was substituted for 0.2% (v/v) Triton X-100 in the lysis buffer. Radioactive phosphocholine produced from [N-methyl-14C]-sphingomyelin (labeled in the choline moiety, CFA566; Amersham Biosciences) was identified by TLC and routinely determined in the aqueous phase by scintillation counting. To identify proteins that directly interact with FAN, we used the yeast interaction trap system. A bait construct containing the full-length FAN cDNA (plex.FAN3–917; Fig. 1⇓A) was used to screen a Jurkat cDNA expression library. In 41 cases, the isolated colonies contained inserts that were identical to various proportions of the C terminus of RACK1, with the shortest insert spanning most of WD repeat V to WD repeat VII (Fig. 1⇓B), suggesting that this is the minimal region through which RACK1 interacts with FAN. In quantitative assays for relative β-galactosidase expression, the interaction of the largest RACK1 clone (pJG.RACK144–317) with plex.FAN3–917 was about 13-fold stronger than with the bait vector control. When the interaction of RACK144–317 with a FAN bait construct containing the putative N-SMase effector domain but lacking the WD repeats (plex.FAN3–547; Fig. 1⇓A) was tested, only a weak β-galactosidase expression of 2.8-fold above bait vector control was measured. Because RACK1 was not isolated in additional screens using FAN3–547 as bait (data not shown), we conclude that binding of FAN to RACK1 is mediated through the C-terminal WD repeats of FAN rather than through its N-terminal region. In an independent screen using a cDNA expression library from HeLa cells, 10 randomly chosen clones interacting with the full-length FAN protein coded for C-terminal portions of RACK1 (data not shown), strengthening the notion that RACK1 is as a potential interactor for FAN. Yeast interaction trap screen implicating RACK1 as a FAN-interacting partner. A, Schematic representation (drawn to scale) of the FAN protein and of the bait constructs FAN3–917 and FAN3–547. The conserved GRAM, BEACH, and WD homology regions of FAN are indicated. The construct FAN703–917 that was used in the mapping of the interaction sites of FAN and RACK1 is shown as well. B, Amino acid sequence of the complete human RACK1 protein. Arrows signal the 5′ ends of the RACK1 cDNAs recovered in the yeast interaction trap screen. The seven WD repeats of RACK1 are boxed and marked by Roman numerals. The association of FAN and RACK1 was further investigated by in vitro binding experiments in a cell-free system. For this purpose, the insert of pJG.RACK144–317 was expressed as a GST fusion protein and tested for its ability to bind to [35S]methionine-labeled, in-vitro-translated, full-length FAN or the unrelated cPLA2. 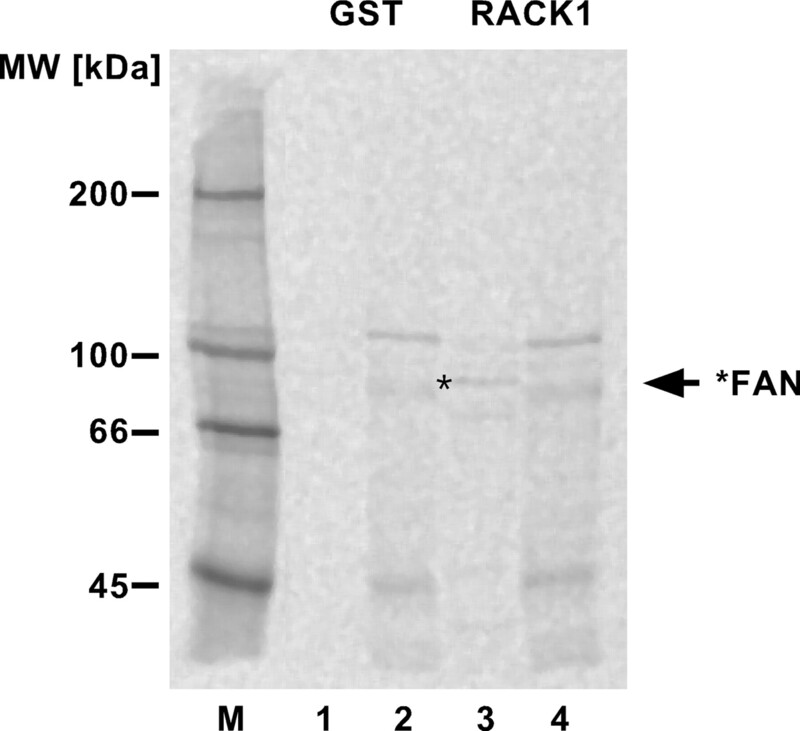 The cPLA2 negative control showed the same pattern of bands with GST alone and with GST-RACK1144–317, indicating that no specific binding of RACK1 to cPLA2 occurred (Fig. 2⇓, lanes 2 and 4). In contrast, FAN bound to GST-RACK1144–317 (Fig. 2⇓, lane 3, asterisk) but not to GST alone (lane 1). Association of FAN and RACK1 in vitro. [35S]methionine-labeled full-length FAN was synthesized by in vitro transcription/translation and incubated with purified GST alone (lane 1) or with GST-RACK1144–317 (lane 3). In vitro transcribed/translated cPLA2 was used as a RACK1-nonbinding control (lanes 2 and 4). Protein complexes were collected on glutathione Sepharose beads, resolved by SDS-PAGE, and visualized by autoradiography on a phosphoimager. The position of in vitro transcribed/translated FAN in lane 3 is indicated by an asterisk. M, Radioactive size marker. Bait and prey constructs for RACK11–317 (the entire coding region), RACK1144–317 (the largest clone isolated in the above screen), RACK1198–317 (the smallest clone isolated), and RACK1204–317 (Fig. 3⇓), as well as for FAN3–917, FAN3–547, FAN703–917 (containing WD repeats II to V at the C terminus of FAN, Fig. 1⇑A), and Apaf-1577–1182 (containing the C-terminal WD repeats I to XII of Apaf-1) were generated as described under Materials and Methods. Combinations of bait and prey constructs were cotransformed into yeast, as outlined in Table I⇓, and tested for β-galactosidase expression. In controls for nonspecific interaction with prey vector pJG4-5 without insert, all bait constructs were negative (data not shown). In line with the results from the previous screens, RACK1144–317 strongly interacted with full-length FAN regardless of which construct was used as bait or prey. This RACK1 construct also interacted as both bait and prey with FAN703–917 containing only the C-terminal WD repeats, confirming that both proteins interact through their C-terminal WD repeats. The RACK1144–317 bait construct interacted with a RACK1144–317 prey construct (self-association); however, it did not show any binding to the WD-repeat-containing C terminus of Apaf-1. Therefore, the interaction of RACK1144–317 and FAN is specific and not due to a general stickiness of the WD-repeat regions of both proteins. Mapping of the FAN-binding domain of RACK1. Schematic representation (drawn to scale) of full-length RACK1 with its seven WD repeats (I–VII) and of C-terminal subfragments used for the delineation of the region through which RACK1 interacts with FAN. The region of RACK1 that mediates binding to FAN is marked by a bracket; the core region that is minimally necessary for binding to FAN is additionally indicated by a dashed bracket. RACK1198–317, the smallest FAN-interacting clone isolated in the previous screens, showed a weaker interaction with full-length FAN as bait but no interaction with full-length FAN as prey. We have observed this nonreciprocal behavior especially in weak interactions, and we attribute it to intrinsic differences in the steric interaction of both partners when bait and prey are switched. Nevertheless, the fact that this clone still interacted with FAN3–917 as bait in the above experiment indicated that this clone contains the minimal domain required for FAN interaction. When tested for interaction with FAN703–917 containing only the C-terminal WD repeats of FAN, RACK1198–317 still showed a strong binding. Like RACK1144–317, RACK1198–317 showed a pronounced self-association. In line with the assumption that RACK1198–317 contained the minimal FAN-binding site, the even smaller construct RACK1204–317 did not bind to full-length FAN anymore in any bait/prey combination. Also, compared with RACK1198–317, the interaction with the WD-repeat coding construct FAN703–917 was strongly reduced. However, RACK1204–317 was still able to strongly associate with itself, indicating that this core fragment retained general binding activity but that specific binding to FAN required additional determinants. When the entire RACK1 protein was used as bait or prey, we found interaction with the C-terminal WD repeats of FAN703–917, but, surprisingly, we could not detect an interaction with full-length FAN. However, full-length FAN also did not show an association with TNF-R55 in these experiments (as measured by β-galactosidase expression; data not shown), although this association has been clearly shown in vivo (6). Moreover, it has been demonstrated that the interaction of RACK1 with the β subunit of integrins or the HIV-1 Nef protein is detectable in yeast with C-terminal RACK1 constructs containing WD repeats V to VII, but not with full-length RACK1 (23, 33). These results are most likely due to limitations of the yeast interaction trap system when the expressed interaction partners become too large to allow the fused DNA-binding and activation domains to drive β-galactosidase expression. In line with this assumption, neither full-length RACK1 nor FAN showed self-association in these assays. All RACK1 constructs showed no or only very weak interaction with FAN3–547 harboring the putative N-terminal effector domain. In summary, the above experiments indicate that the interaction of RACK1 with FAN is mediated by a core region of RACK1 that comprises WD repeats IV to VII and that minimally must encompass parts of WD repeat V (C-terminal of amino acid 198) as well as the WD repeats VI and VII (Fig. 3⇑). In an independent approach, we wanted to determine whether FAN contained further potential protein-binding sites. Similar to a previous experiment that had identified the binding motif for FAN within TNF-R55 (6), we used a cellulose-bound peptide scanning library staggered by three amino acids each, containing overlapping 13-mer peptides of the entire FAN protein (Fig. 4⇓A). Jurkat cells were metabolically labeled, and total cellular extracts were assayed for binding to the staggered peptides. Within the putative effector domain of FAN, regions of significant binding spanned peptides 14–18, 57–60, 79–80, and 189–191. However, none of the peptides contained in these regions is localized entirely within the GRAM or BEACH domain of FAN. The only peptides from these domains that bound cellular proteins significantly over background were peptides 121 and 153–154, both located in the BEACH domain (Fig. 4⇓B). 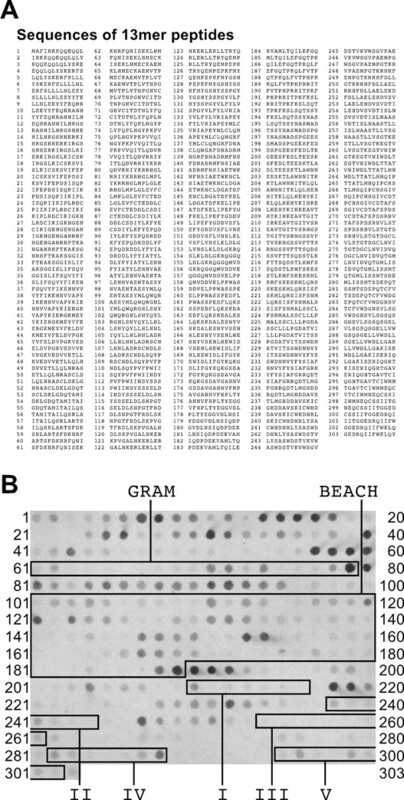 Apparently, the GRAM and BEACH domains of FAN do not contain extended linear protein-binding motifs detectable by the staggered peptide scanning assay. Nevertheless, the peptide stretches detected outside of both domains may mark the binding sites of yet-unidentified proteins potentially participating in the signal transduction pathways of FAN. Within the WD repeats of FAN, only peptide 288 displayed significant binding to the labeled extracts (Fig. 4⇓B). This was somewhat surprising, because it could be expected that RACK1 or other WD-repeat binding proteins present in the labeled extracts should produce a “footprint” of labeled peptides in this assay. Apparently, the WD repeats of FAN must be folded into the suggested multibladed-propeller secondary structure for interaction with other proteins such as RACK1. Because this secondary structure is not represented adequately by linear binding motifs, the interaction of FAN and RACK1 is apparently not detected by the staggered peptide scanning assay. Mapping of linear protein binding sites on the FAN protein. A, 13-mer peptides from the FAN protein sequence staggered by three amino acids bound to cellulose membranes that were used in the staggered peptides scanning assay. B, Protein binding domains of FAN. [35S]methionine-labeled whole cell extract from Jurkat cells was assayed for binding to the FAN-derived peptide scanning library. Bound radioactivity was visualized by autoradiography and quantified using a phosphoimager. The conserved FAN homology domains GRAM and BEACH are indicated, and the WD repeats of FAN are marked by Roman numerals. 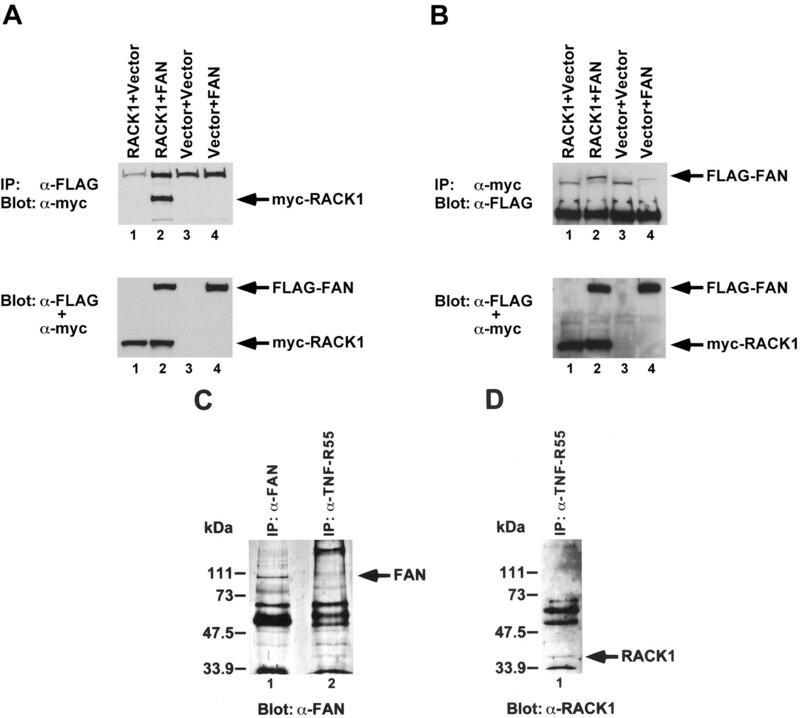 To elucidate whether full-length RACK1 and FAN were able to interact in intact cells, 293 cells were transiently transfected with a myc-tagged version of RACK1 (pMYC.RACK1–317) in combination with a FLAG-tagged full-length FAN construct (pFLAG.FAN3–917; Ref. 6). For control, cells were additionally transfected with pMYC.RACK1–317 or pFLAG.FAN3–917, in combination with the parental vectors pFLAG.CMV2 or pcDNA3.1−/Myc-His A, and finally with both empty vectors alone. The expression of the transfected fusion proteins was confirmed in Western blots with anti-myc and anti-FLAG Abs (Fig. 5⇓, A and B; lower panels). In parallel, identical amounts of cellular lysates were immunoprecipitated using anti-FLAG Ab and coimmunoprecipitating RACK1 was detected in Western blots with anti-myc Ab. As shown in Fig. 5⇓A (upper panel), RACK1 was present only in FAN immunoprecipitates (lane 2) but not in control immunoprecipitates (lanes 1, 3, and 4). In reverse experiments, RACK1 was immunoprecipitated with anti-myc Ab and coimmunoprecipitating FAN was detected in Western blots with anti-FLAG Ab. A band corresponding to the exact size of FAN was detected specifically in RACK1 immunoprecipitates (Fig. 5⇓B, upper panel, lane 2). Similar results were obtained when RACK1 was immunoprecipitated with a mAb directed against RACK1 itself (data not shown). Because the interaction of overexpressed proteins has to be interpreted with caution, we additionally examined whether the endogenous RACK1 and FAN proteins could be detected in a complex with TNF-R55. For this purpose, TNF-R55 was immunoprecipitated from nontransfected 293 cells, and the presence of endogenous FAN and RACK1 in the immunocomplexes was analyzed with Abs against the endogenous proteins. In the case of FAN, a very faint band was detected (Fig. 5⇓C, lane 2). This band exactly corresponds to the predicted size of the FAN protein, and also exactly corresponds to the more prominent band detected in a control immunoprecipitation of the total endogenous FAN protein followed by Western blot with the same Ab (Fig. 5⇓C, lane 1). Similarly, a band of the predicted size of RACK1 was detected in the TNF-R55 immunoprecipitates by the Ab against endogenous RACK1 (Fig. 5⇓D). Identical results (with proportionally stronger bands) were obtained when 293 cells transfected with pMYC.RACK1–317 or pFLAG.FAN3–917 were analyzed (data not shown). In summary, these data suggest that not only overexpressed but also endogenous FAN and RACK1 are present in a complex with TNF-R55 in intact cells. RACK1 and FAN associate in vivo. A, 293 cells were transiently transfected with expression constructs (5 μg each) for myc-tagged RACK1, FLAG-tagged FAN, and control vectors without insert. Upper panel, Coimmunoprecipitation of RACK1 with FAN. Cell lysate (3 mg) was incubated with anti-FLAG Ab M2 to immunoprecipitate FAN and blotted with anti-myc Ab to detect coimmunoprecipitating RACK1. Lower panel, Western Blot for expression of FAN and RACK1 in 293 cells. Protein (20 μg per lane) was loaded and analyzed with a combination of anti-FLAG and anti-myc Ab. B, 293 cells were transfected as in A. Upper panel, reverse coimmunoprecipitation of FAN with RACK1. Cell lysate (2 mg) was incubated with anti-myc Ab to immunoprecipitate RACK1 and blotted with anti-FLAG Ab M2 to detect coimmunoprecipitating FAN. Lower panel, Western Blot for expression of FAN and RACK as in A. C and D, Endogenous FAN and RACK1 are present in a complex with TNF-R55. The endogenous TNF-R55 was immunoprecipitated from 2.7 mg of 293-cell lysate with the monoclonal anti-TNF-R55 Ab htr-9 and blotted with anti-FAN Ab to detect coimmunoprecipitating endogenous FAN (C, lane 2, arrow) or with anti-RACK1 Ab to detect endogenous RACK1 present in the complex (D). For control, total endogenous FAN was immunoprecipitated and blotted using anti-FAN Ab (C, lane 1). The positions of molecular mass markers (in kilodaltons) are indicated on the left. 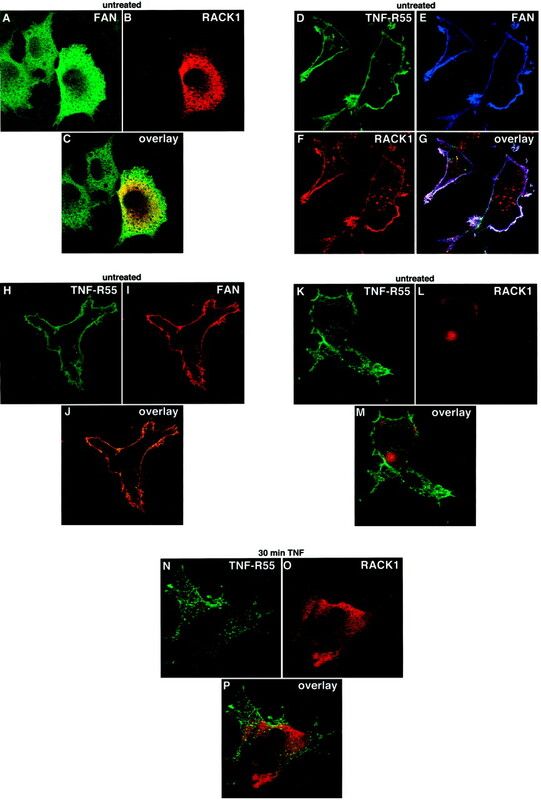 The intracellular distribution of FAN and RACK1 was investigated by indirect immunofluorescence staining in combination with confocal laser-scanning microscopy. Because the FAN Ab used in the coimmunoprecipitation experiments did not recognize endogenous FAN with sufficient specificity for immunofluorescence analyses (data not shown), we analyzed COS-1 cells that were transiently transfected with FLAG-tagged FAN (pFLAG.FAN3–917) in combination with myc-tagged RACK1 (pMYC.RACK1–317) and detected the tagged proteins with anti-FLAG and anti-myc Abs. Both FAN (Fig. 6⇓A, green) and—in line with previous reports (27, 39, 42, 50)—RACK1 (Fig. 6⇓B, red) were detected in the cytoplasm, but not in the nucleus of the cells. The overlay image shows some overlap in the localizations of FAN and RACK1 (Fig. 6⇓C, yellow). However, the association of FAN andRACK1 became much more prominent in experiments in which we additionally transfected a truncated form of TNF-R55 (TNF-R55Δ345). This mutant contains a C-terminal deletion that destroys the death domain, thereby eliminating the cytotoxic effects of an overexpressed TNF-R55, but still carries a functional NSD that permits binding of FAN (4, 49). In the presence of TNF-R55Δ345 (Fig. 6⇓D, green), FAN (Fig. 6⇓E, blue) and RACK1 (Fig. 6⇓F, red) showed a translocation from the cytoplasm to the plasma membrane, and a pronounced colocalization of all three proteins at the plasma membrane was detected in the overlay of the individual detection channels (Fig. 6⇓G, white). In experiments in which only pFLAG.FAN3–917 and pEF.TNF-R55Δ345 were transfected into COS-1 cells, an identical colocalization of FAN and TNF-R55 at the plasma membrane could be observed as yellow coloring (Fig. 6⇓, H–J). However, when COS-1 cells were transfected with pEF.TNF-R55Δ345 in combination with pMYC.RACK1–317, RACK1 did not colocalize with TNF-R55 but stayed distributed throughout the cytoplasm (Fig. 6⇓, K–M). This lack of colocalization did not change after treatment of cells with TNF (although TNF clearly induced internalization of TNF-R55; Fig. 6⇓, N–P), indicating that the endogenous FAN present in these cells is most likely not abundant enough to induce a detectable colocalization of the overexpressed TNF-R55 and RACK1 molecules, regardless of the presence of TNF. Although experiments with overexpressed proteins have to be interpreted with care, these results suggest that the association of FAN and RACK1 is apparently enhanced by the membrane receptor TNF-R55. As shown above, TNF-R55 most likely first forms a complex with FAN at the plasma membrane (Fig. 6⇓, H–J). This complex may then recruit RACK1 more efficiently (Fig. 6⇓, D–G) than FAN alone recruits (Fig. 6⇓, A–C). As TNF-R55 is expressed only in very low receptor numbers due to the intrinsic cytotoxicity of its cytoplasmic domain (51), the TNF-R55-FAN-RACK1 complexes might not become visible in cells expressing only the endogenous TNF-R55 (Fig. 6⇓C). RACK1, FAN, and TNF-R55 colocalize at the plasma membrane in intact cells. The intracellular localization of FAN (A, green) and RACK1 (B, red) was investigated in COS-1 cells transiently transfected with pFLAG.FAN3–917 and pMYC.RACK1–317. C, Overlay image showing the overlap in the intracellular distribution of FAN and RACK1 (yellow). Independently, COS-1 cells were transiently transfected with a noncytotoxic, FAN-recruiting mutant of TNF-R55 (TNF-R55Δ345, D, green) and additionally to FAN (E, blue) and RACK1 (F, red). The colocalization of all three proteins at the plasma membrane is clearly visible in the overlay picture as white coloring (G). A similar colocalization at the plasma membrane is visible when COS-1 cells were transfected only with TNF-R55Δ345 (H, green) and FAN (I, red) as shown in panel J (yellow). In contrast, transfection of TNF-R55Δ345 (K, green) and RACK1 (L, red) without FAN did not result in detectable colocalization (M). In parallel, cells were transfected as in K–M but additionally stimulated with 50 ng/ml human TNF for 30 min. Although TNF clearly induced the internalization of TNF-R55Δ345 from the plasma membrane into vesicles (N, green), no alteration in the cytoplasmic distribution of RACK1 (O, red) and no colocalization was detectable in the absence of transfected FAN (P). The cells were analyzed by confocal laser-scanning microscopy as described in Materials and Methods. Because FAN is required for the activation of N-SMase by TNF, we investigated whether RACK1 is also part of the signaling pathway leading from TNF-R55 to N-SMase. 293 cells were transiently transfected with control vector pcDNA3.1−/Myc-His A or with pFLAG.FAN3–917, pMYC.RACK1–317 or pEF.TNF-R55Δ345 either as individual plasmids or as a combination of all three constructs. As shown in Fig. 7⇓ and in line with previous results (6), transfection of pFLAG.FAN3–917 enhanced the activity of N-SMase after TNF treatment. In contrast, transfection of pMYC.RACK1–317 consistently resulted in a diminished stimulation of N-SMase by TNF. Overexpression of TNF-R55Δ345 did not significantly alter the response of N-SMase toward TNF, confirming that TNF-dependent N-SMase activity is not elevated by stable expression of high numbers of noncytotoxic TNF-R55 deletion mutants (4). Similar to the colocalization experiments where combined expression of all three proteins showed the most pronounced colocalization, the simultaneous transfection of pFLAG.FAN3–917, pMYC.RACK1–317, and pEF.TNF-R55Δ345 into 293 cells resulted in the strongest increase in the sensitivity of N-SMase toward TNF, supporting the notion that a complex of TNF-R55, FAN, and RACK1 may be most efficient in stimulating N-SMase. Taken together, these results suggest that RACK1 has a modulating function in N-SMase activation, and implicate RACK1 as a novel component in the signaling pathways of TNF-R55. TNF-dependent activation of N-SMase is modulated by RACK1. 293 cells transiently transfected with pcDNA3.1−/Myc-His A, pFLAG. FAN3–917, pMYC. RACK1–317, or pEF.TNF-R55Δ345 were stimulated with 100 ng/ml human TNF for 0–5 min. Extracts containing the cytosolic/membrane fraction were prepared and assayed for N-SMase activity using the substrate [14C]sphingomyelin as described in Materials and Methods. TNF-induced N-SMase activities are expressed as percentage of untreated vector-transfected cells. The peak activity of N-SMase measured during the 5-min stimulation period is shown. The values represent the means from triplicate determinations; error bars indicate the respective standard deviations. The results are representative for four independent experiments. FAN and RACK1 both represent members of the evolutionarily conserved WD-repeat family of proteins. This protein family contributes to cellular functions as diverse as mRNA processing, transcriptional regulation, assembly of the cytoskeleton, control of cell division, and vesicular trafficking (5). WD-repeat proteins that have been implicated in signal transduction include the β-chains of heterotrimeric G proteins (52), the phospholipase A2-activator protein PLAP (53), the regulatory subunit of phosphatase 2A (54), as well as FAN and RACK1 themselves (6, 19). Here, we report the isolation of RACK1 as a FAN-binding protein and present evidence that RACK1 modulates activation of N-SMase by TNF. The interaction of RACK1 and FAN was established by multiple independent methods, including 1) the yeast interaction trap system, 2) the binding of in-vitro-translated FAN to a bacterially expressed GST-RACK1 fusion protein, 3) coimmunoprecipitation experiments of overexpressed as well as endogenous proteins, and 4) colocalization studies of FAN, RACK1, and TNF-R55 in whole cells. Our results indicate that the interaction of FAN and RACK1 most likely requires folding of the WD repeats into a secondary structure–possibly the proposed multibladed-propeller structure—because no prominent linear protein-binding motifs were identified within the WD-repeat region of FAN. Deletion studies confirm that binding of FAN and RACK1 requires a crucial region in the C-terminal WD-repeat region of FAN. RACK1, in turn, interacts with FAN through a region comprising at least parts of WD repeat V to WD repeat VI. Because this region is sufficient for binding, it is conceivable that folding of RACK1 into a complete seven-bladed-propeller structure is not essential for its association with FAN. The very same region of RACK1 has also been implicated in its binding to the integrin β subunit and to the HIV-1 Nef protein as well as to the cAMP-specific phosphodiesterase isoform PDE4D5 (23, 33, 55). Obviously, this region constitutes an interface through which RACK1 can interact with various different proteins. We have shown that, upon overexpression as tagged proteins, full-length RACK1 coimmunoprecipitates with full-length FAN and vice versa, demonstrating that the two proteins form a complex in intact cells. However, because RACK1 can bind to many different proteins, the significance of its association with FAN in artificial systems, such as yeast, or upon overexpression had to be verified by additional experiments. By immunoprecipitating the endogenous TNF-R55 from nontransfected cells, we were able to demonstrate the presence of endogenous FAN and RACK1 in the immunocomplexes by Western blots. Despite the limited specificity of the currently available reagents against endogenous FAN and RACK1, these experiments provide unequivocal evidence that both endogenous FAN and RACK1 do form a complex with TNF-R55 in untransfected cells, further strengthening the notion of RACK1 as a mediator of TNF-R55-induced signals. However, the question remains whether RACK1 precipitates by direct interaction with TNF-R55 or indirectly via endogenous FAN that is bound to TNF-R55. Because we had also isolated a fragment of RACK1 during the yeast interaction trap experiments in which FAN was identified as an interactor of TNF-R55 (our unpublished observation), we currently cannot exclude the possibility that RACK1 and TNF-R55 are able to interact directly to some extent, at least in the yeast system. In support of these findings, our colocalization data suggest that FAN and TNF-R55 form a complex at the plasma membrane, to which RACK1 colocalizes more efficiently than to either FAN or TNF-R55 alone. Therefore, we propose that TNF-R55, FAN, and RACK1 may be able to form a trimolecular complex in which all three proteins contain binding sites for the other two partners, similar to a complex between PKC, RACK1, and PH domain-containing proteins described by Rodriguez et al. (43). However, the formal proof for the existence of a trimolecular complex not only of overexpressed but also of endogenous TNF-R55, FAN, and RACK1 will have to await the development of more specific reagents. Definitive evidence for a role of RACK1 in the signaling machinery of TNF-R55 is provided by our observation that RACK1 modulates the sensitivity of N-SMase toward TNF. The inhibitory effect of overexpressed RACK1 on the activation of N-SMase by TNF suggests that an excess of RACK1 may interfere by binding to endogenous FAN, thereby making it unavailable for the transduction of signals from TNF-R55. Notably, overexpression of TNF-R55Δ345 alone did not significantly alter activation of N-SMase by TNF, while overexpression of FAN enhanced the response of N-SMase to TNF. Thus, it appears that, in normal cells, the response of N-SMase to TNF seems to be limited by downstream components of the signaling pathway, such as FAN. RACK1 apparently also belongs to these components, because the simultaneous overexpression of TNF-R55Δ345, FAN, and RACK1 increased the responsiveness of N-SMase to TNF in a substantial manner when compared with any individual transfection. In summary, these results clearly define RACK1 as a functional component of the signaling pathway from TNF-R55 to N-SMase. We thank Dr. Xiaodong Wang for the Apaf-1577–1182 construct and Sandra Ussat and Andrea Ruff for technical assistance. ↵1 This work was supported by grants from the Center for Molecular Medicine Cologne to M.K. and from the Deutsche Forschungsgemeinschaft (SFB415) to S.A.-K. and D.A. ↵2 A.E.T. and S.A.-K. contributed equally to this paper. ↵4 Abbreviations used in this paper: N-SMase, neutral sphingomyelinase; NSD, N-SMase-activating domain; BEACH, Beige and CHS; FAN, factor associated with N-SMase activation; NP40, Nonidet P-40; PH, pleckstrin homology; PKC, protein kinase C; cPLA2, cytosolic phospholipase A2; RACK, receptor for activated C-kinase. Sambrook, J., E. F. Frisch, T. Maniatis. 1989. Molecular Cloning: A Laboratory Manual 2nd Ed. Cold Spring Harbor Lab. Press, Plainview, NY.